Project with Ferroglobe Group: Efficient Silicon Production Strategy. This project studies an industrial furnace for the purification of solar silicon. The goal is to improve its efficiency and productivity through the integral numerical simulation of the coupled physical processes (electromagnetic, thermal, hydrodynamic, thermodynamic and structural) that take place inside it. Nowadays, the application of this refining technique represents one of the main bottlenecks for expanding the process of solar silicon production to an industrial scale, which is much more sustainable from the energetic and environmental point of view than the traditional chemical procedure. The company, that has decided to bet on this technology, has been provided with a tool that allows it to control the behavior of the system, and determine the influence of the geometric and operating parameters in its performance, in order to optimize the process and avoiding trial-error tests in plant which are technically and economically very expensive. 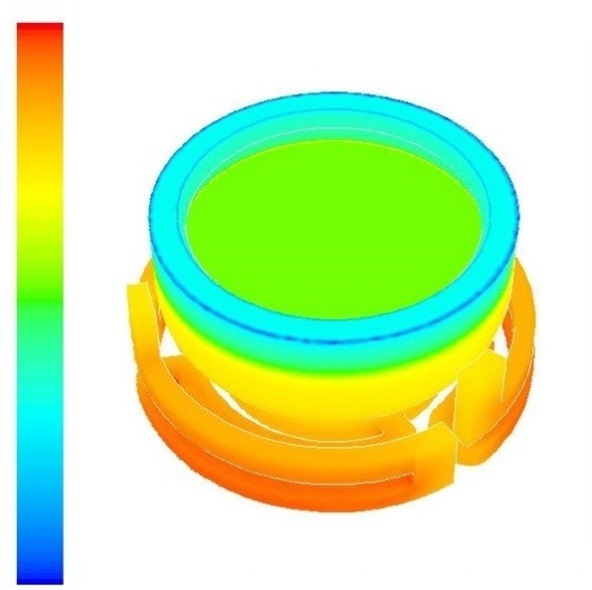 Thermal simulation of the furnace. In addition, the structural model has been incorporated into the simulation tool. It allows to study in detail the parts of the machine subjected to greater thermal and mechanical stress, to understand the origin of deformations and damages in the material and to design alternatives without compromising the performance of the process . Another important milestone has been the application of the model to the study of furnaces of greater capacity, which operate according to the same principle but which allow larger amounts of material to be processed. Specifically, the numerical simulation has helped the company to make a reliable estimation of the increase in power consumed by operating with larger machines without losing performance in the process. It has also allowed them to assess possible changes in the initial design.